Traders tend to react to news when it’s released. Then, they read the story, analyze the details and make a decision about how the news will actually affect the company. Sometimes, the initial reaction was justified and at other times it was not. This pattern appears to be unfolding in Everest Re Group, Ltd. (NYSE: RE) right now. The company underwrites reinsurance and insurance in the United States, Bermuda and international markets. Reinsurance is the insurance that insurance companies buy. When a customer buys insurance, the insurer is accepting risk. Sometimes, the insurer will want to limit their risk and to do that, they buy reinsurance. That means the original company’s potential losses are capped and the reinsurer accepts the risk above that cap. Everest Re is one of the companies that insures insurance companies. This is a business that Warren Buffett famously loves because it generates amounts of cash flow that can be used to fund other opportunities. Shares of Everest Re sold off after the company announced that it expects to incur $100 million of estimated catastrophe losses, net of reinsurance recoverables and reinstatement premiums, in the first quarter of 2018, largely arising from the California wildfires and related events. A series of wildfires burned across many areas of California in October and December of 2017, resulting in widespread damage to homes and businesses. The company’s initial estimate of these losses in the fourth quarter of 2017 was based on the best available information at the time, including modeled data, industry loss estimates, which ranged from $8 billion to $10 billion, and preliminary client discussions. Industry loss estimates for both the Northern and Southern California events have risen dramatically since year-end and are now projected at over $13 billion. This increase in the industry loss estimate is consistent with the revised reports of escalated claims costs Everest Re noted with several of its clients, prompting the change in the company’s estimate in the quarter. RE has been among the leaders for the past two years. The recent decline completes what appears to be a cup and shoulder pattern on the chart as the next chart shows. This pattern is a favorite of momentum traders. This pullback could provide an ideal entry opportunity for momentum traders. It could also be an entry point for value investors. RE is trading with a price to earnings (P/E) ratio of about 11. The dividend yield on the stock is more than 2.0%. These are attractive metrics in a stock market that has been consistently overvalued for years. Another factor making the stock potentially appealing to value investors is the company’s ability to generate cash flow, the characteristic that attracts Warren Buffet to the reinsurance industry. Over the past seven years, RE grew cash flow per share by an average of more than 50% a year. Cash flow is ultimately what a company needs for growth. Cash flow can be reinvested in operations. In this case that would allow RE to fund more reinsurance. Cash flow could also be used to fund acquisitions, always a possible move in a cash intensive business such as this. Companies also use cash flow to reward investors. RE has been doing this with its rapidly growing dividend. Over the past seven years, dividend growth averaged 14.8% a year. The company has also been buying back shares, reducing its share count by 25% over that same time. Among those strategies is a bull put spread could be used. The risk and reward diagram is shown below and it offers limited risk with limited potential gains. However, it is well suited for a stock which is in an up trend. 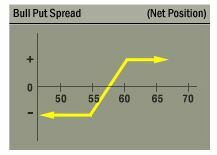 For RE, a bull put spread could be opened with the May 18 put options. This trade can be opened by selling the May 18 $240 put option for about $3.10 and buying the May 18 $230 put for about $1.50. This trade would result in a credit of $1.60, or $160 per contract since each contract covers 100 shares. That amount is also the maximum potential gain of the trade. The maximum possible risk is the difference between the exercise prices of the two options less the premium received. For this trade, the difference between exercise prices is $10 ($240 – $230). This is multiplied by 100 since each contract covers 100 shares. Subtracting the premium from that difference means, in dollar terms, the total risk on the trade is then $840 ($1,000 – $160).